Air quality is so poor that some experts claim walking the streets of the Indian capital at this time of the year is as bad for your health as smoking 50 cigarettes a day. Peaks like this are an annual occurrence, but there’s little political will to do anything about it. 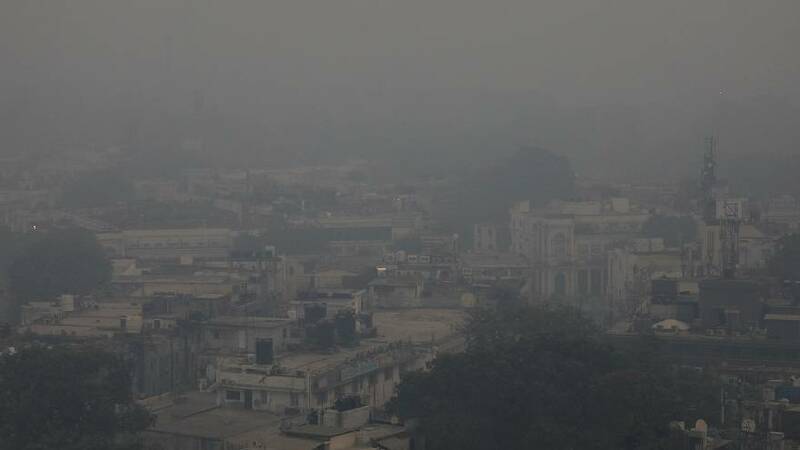 The smog is caused by a mixture of stubble burning in the local region and urban pollution and it exposes residents to up to 24 times the recommended limit of dangerous particles. Unlike in other countries face masks are a rare sight among most members of the public - but some protesters have had enough. "I keep on getting unwell because of the air pollution, like my eyes start burning,” says student Asees Kandhari. “And even after medicines, it doesn't heal. It only heals when I go out station, maybe to America or somewhere where the air is way better." "Basically in the evenings we can't go to the parks to play for long. Like if we go out at 5 we have to come back at 6 max. Because then it's all foggy and grey sky," says student Rishabh Jain, 14. The government has introduced subsidies for farmers to encourage them to stop burning stubble - but they’ve had little effect because the farmers say they’re not enough. "I think there's brilliant policies in place,” says Help Delhi Breathe campaigner Navdha Malhotra. "There's very strong plans on paper. Unfortunately nothing is implemented. And the government is being very lethargic. This is public health emergency, we are at crisis levels. We have no time to lose. They must take urgent action." Prime Minister Narendra Modi's is facing elections next years but the ecology is not proving a big issue. The electoral importance of the urban population is outweighed by rural regions. Modi is more concerned about the impact of weak farm incomes, high fuel prices and job creation. And that indifference goes from top to bottom. Most of the city's residents are poor and are more worried about making enough money to buy food than pollution. The daily grind leaves no room to think about the haze and smog.